Cooking is my hobby and healthy food is my life. I booked fridge and stove cleaning few days ago and I am pleasantly surprised with the results. I will never hesitate to book another service. Cheers! Great work from the cleaners in Maidenhead. They performed a really professional service. The whole kitchen, including the oven, the bbq, the fridge look great. Would recommend. Maidenhead SL6 calm and peaceful life close to the nature-inspired us to offer you one of the healthiest oven cleaning services on the market. Weekly cleaning routines of a household are directed to maintaining the order in everyday life. A well-arranged house is admired, but the real housewife knows that the most important room is the kitchen. This is the busiest place in your home. Keeping your kitchen spotless and germ-free means you are concerned for your family’s well-being. Show you care! Go the extra mile and order professional cleaning today! First, the professionals wear overshoes inside. Second, they remove all fragile objects away from the cleaning area. Know that the cleaners are in your home to make it better and do the best to avoid causing any damage. Experienced maintenance technicians follow standard procedure. Time saving and quality controlled work is part of the professionals routine. The client is always informed on the average estimated duration of the service. That way you will know when you can start preparing the family meal. There is no mistake! With those sanitising methods, you can use your kitchen oven within minutes after the procedure! More about it you can see also on our pages for Marlow , Bourne End and Windsor . Once the service is done the client is invited to inspect the result. You will see that all detachable parts of the oven, the door and the hobs are sparkling clean. This is possible with our Deluxe Deep Tank cleaning method. All removable parts are soaked in a cleaning solution and washed with water afterwards. The solvents are child and pet safe and leave no residue on the cooker or the cook-top. Many of our clients in Maidenhead SL6 confirm the refreshed appearance of their cookers and cookware. 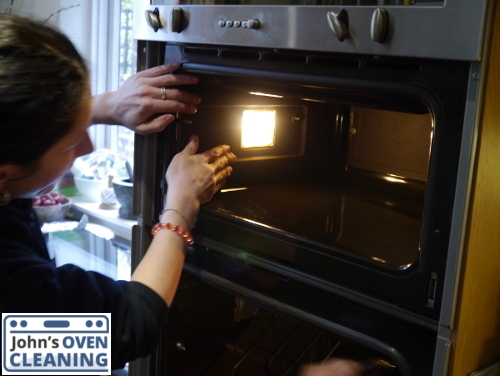 But the long-term effects of the deep oven cleaning method is hidden in the better taste of the food. We are often booked for our complex and extended services. Upon calling, each client is provided with a quota according to the stated needs. Don’t forget to pick one of the various payment methods we provide. Call today and take advantage of the latest bonuses on kitchen and appliances valeting. Priority is following the client’s schedule. That is why our call centre works 24/7. Call us at 020 3404 4096. You can also contact us online at the best convenient time for you.